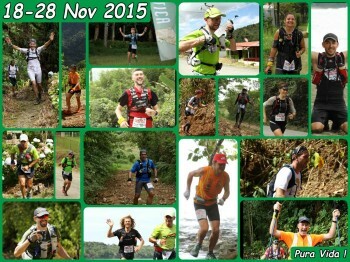 The 8th Edition of the Costa Rica-Trail- La Transtica will be proposed from November 18th, 2015 to November 28th, 2015. Extreme race: 196 km from 30 to 40 km per day with a total positive gain of altitude of 27 500 ft (8 400 m) qualifying for 3pts UTMB.. The COSTA RICA TRAIL, LA TRANSTICA is a free pace multi day Trail race, with a prologue and 5 stages with refreshment and assistance points, night in bivouac for a total distance from 71 mi (120 km) (Adventure Race) to 121mi (196 km) (Extreme Race). Between two oceans, the race defines itself by a unique crossing of a natural amazing paradise in the discovery of a new culture and way of life, “Pura Vida”. Starting from Pacific Coast to reach Caribbean Coast through amazing and varied landscapes combining beaches, valleys, river crossing, rainforests, coffee trees, sugar cane plantations and palm groves. On the way the competitors, will discover an exceptional flora and fauna and will be associated to donations of medical and school equipment, moments of emotion, exchanges and sharing. During the bivouacs, managed by the local communities, they will enjoy the welcome from Costa Rican people. From the beach of Manuel Antonio on the Pacific Coast up to Puerto Viejo de Limon on the Caribbean Coast.The change of scene is amazing; the runners are plunged into the deep heart of Costa Rica far from the tourist standards.